Two students are hunched over in desks, their legs bent at bizarre angles in the cramped leg room — the sight is nothing new. Instead of being inside a classroom, however, they’re in the middle of a park path, with motors where a backpack should have been placed. Sophomore Peter Martin inserts his key into the first of his four switches in his desk — the only one which currently works. The lights have blown out, the horn broke, the third doesn’t connect to anything, but the ignition switch still starts the desk. After a wave to begin, Martin begins the race at a speed of 30 mph. His vehicle races over the grass and onto the concrete, harshly stopping at the finish line and sacrificing a bit of his tires, which erode at the brutal stop. Sophomore Nathan Kim, with his sweatshirt wrapped around his neck as to not get it caught in his motor, starts his engine, too, and races around the track of the local park. After reaching the finish line both are eager to know who was faster. Martin wins by three seconds but neither is surprised as both of them know the ins-and-outs of their motorized desks. 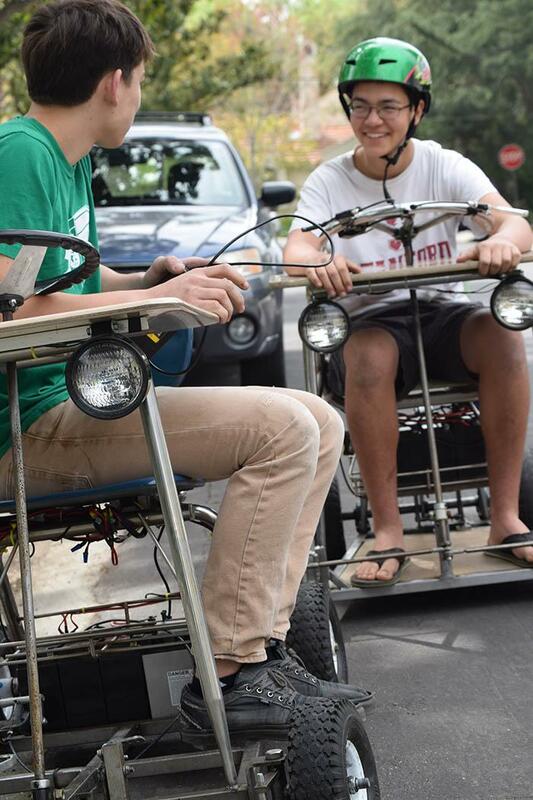 Kim and Martin are known to Palo Alto High School as the “the kids with the driving desks” yet to each other as guys with a knack for building things. This year, they found themselves in Paly’s spotlight after they followed the Spirit Week sophomore float in their desks, which were dressed up as firetrucks to match the theme. The first day Kim and Martin walked into their shared auto shop class, they were both overwhelmed. For a pair of boys on a high from their industrial tech classes as middle schoolers, being surrounded by car skeletons transcended their time in the shop from a class into an adventure. “The famous story? We go to our desks and we were super excited for class,” Kim says, “We were pretending to drive in our desks, and then, we were like, ‘what if we actually did this?’” “Most of it was his idea, I just piggybacked along for the ride,” Martin says. Once they had decided their project, they took it step-by-step, using the intellectual and physical tools passed down from their fathers. Martin’s father collected his tools working as a surgeon while Kim’s father’s tools came from building prototypes of sports equipment, creating an environment where the two were able to learn from an early age. The two settled down in Martin’s garage for the project which was a garage-turned-workspace fully equipped with machinery, a bathroom, a sink and a shower. The materials for the motorized desks were first purchased online, but the rest came from creative, out-of-the-box thinking. Kim and Martin would ‘dumpster dive’ to find cost-effective resources. “A lot of it [goods found in dumpsters] is broken, but every once in awhile you might find something that’s cool, that does work out sometimes. We got lucky this time,” Martin says, crediting the Stanford campus as the ideal place to find high quality once-loved electronics of engineering students. The colleges’ end-of-year waste makes up a large portion of their motorized desks, with the desks themselves coming from Paly’s very own dumpsters after getting the thumbs-up from the janitors. “Most of it [the desk] is just a small simple go-kart frame, with some generic electronics from an electric scooter,” Kim says. “We just modified the steering a bit and added a desk on top to complete the work.” They set a goal to finish before the end of the school year so that on the last day, they could pridefully roll up onto campus. “Every weekend I was going over there [Martin’s garage] in the morning to work on the project, and finished like a week before the last day of school,” Kim says. Their personal dead-lines and hard work did pay off in the end, with their diligence being rewarded with a sweet ride.